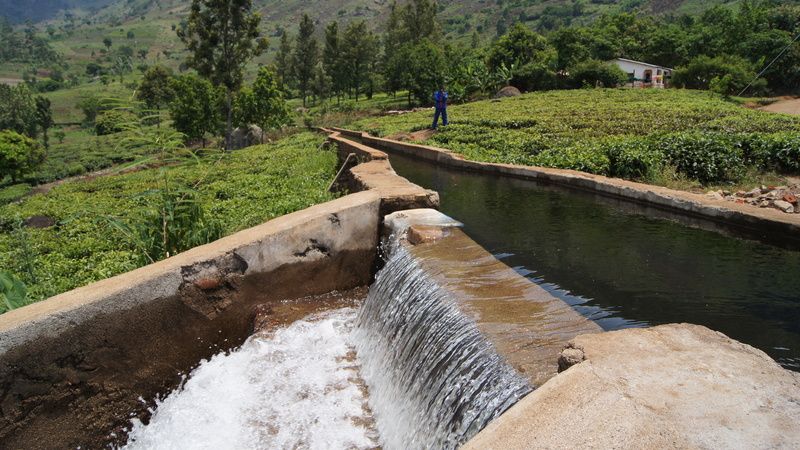 The construction of the dam is a mixture of stones, bricks and concrete. The dam crosses the river between several enormous boulders. The canal takes the water out of the dam to the left of the river flow and across the hillside for around 700m. The canal is made of locally produced clay bricks. These were supplied and delivered by local people. Whilst the local population did not contribute financially to the construction they helped with labour, materials and time. The panorama below shows the dam and canal to the left of the picture. Click for larger image. The canal is around 1 metre wide and a metre deep transporting around 20 cubic metres of water per second. The canal is of brick construction with a capping of concrete. The internal channel is lined with smooth concrete. The settlement tank prevents rocks entering the canal. During periods of heavy rain large rocks roll over the dam and into the settlement tank. 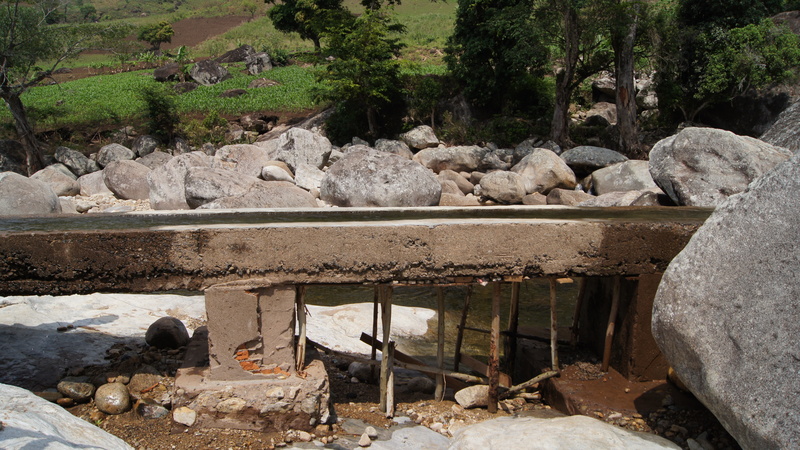 The settlement tank has already been cleared once by locals after it became full of rocks after a heavy rain event. There are three aqueducts along the canal, the longest of which is around ten metres. It was built using concrete struts. It was apparent during the site visit that two of the aqueducts had either sagged or were not level after construction and were allowing water to overflow. In parts the construction is of a low quality and cracks are already visible. There are also leaks along the length of the canal. 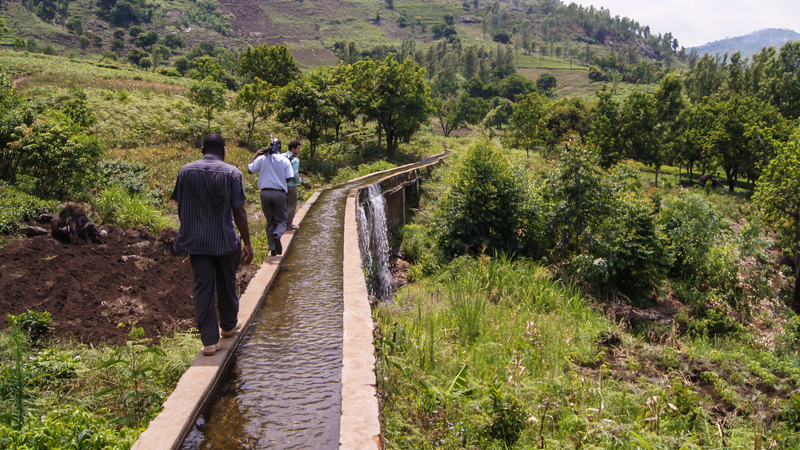 The most vulnerable part of the system is the first aqueduct on the river (illustrated) which could be affected by erosion/impact when the river is high. Like any structure it is important that the condition of the system is inspected regularly and improvements/repairs made when necessary to prevent any shut down of the hydro plant. Walking along the canal – note the water overflowing on the aqueduct. 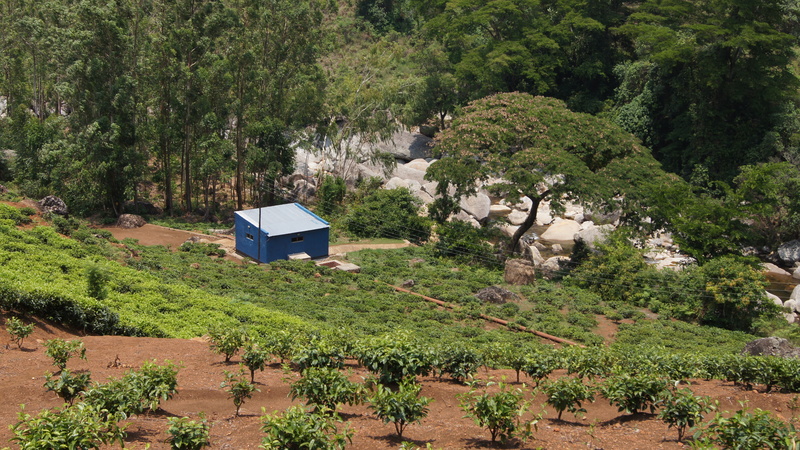 The canal fits well into the landscape and follows the contours through a largely tea growing area. The canal ends at the headgate where another filter removes debris prior to the water entering the penstock. A concrete and brick spillway returns excess water to the river. The end of the canal – spillway is on the left, headgate and filter is on the right. The penstock devlivers the water to the generating building, located down the hill. The water is fed into the generator through three pipes, each which can be independently controlled to ensure a balanced output. Water leaves the building through the tailrace channel which flows for 10m until it rejoins the river. The generating building with penstock entering from the right. The main challenge for the system is ensuring the canal is not damaged during period of heavy rain and rock movement on the river. Concerens were raised during the visit regarding erosion of concrete around the dam area. In addition leaks need to be monitored to ensure they do not grow too large and begin affecting the overall flow to the penstock. It is clear that the local community and system technicians are regularly inspecting the system. It is important that any lessons learned can be applied to the next proposed hydro scheme.